Samsung has released its latest Smartphone in the market, the Samsung Galaxy A9. It is the first Smartphone in the world with quad rear cameras. The launching took place in Kuala Lumpur, Malaysia during the company’s Galaxy An event. Besides, when the launch was taking place, it was streamed live through Samsung’s official Newsroom site. In the features, the new Samsung Galaxy A9 has a 6.3 inches infinity display. It also has four rear cameras, that have 24MP primary sensor having pixel merging technology, a depth camera lens and an ultra-wide camera sensor of 120 degrees with a 2x zooming telephoto lens. The selfie shooter for this Smartphone is 24MP. 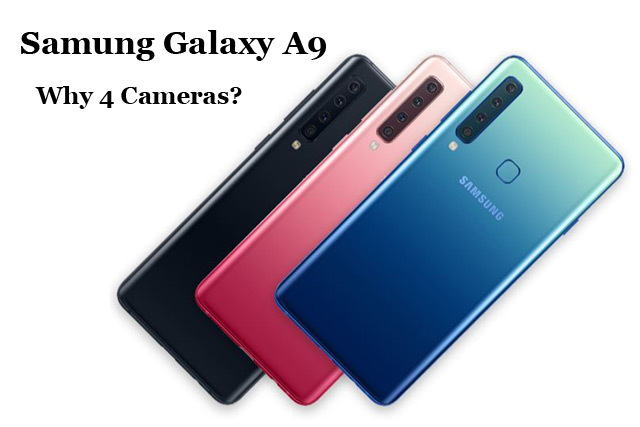 Besides, Samsung Galaxy A9 is from the Samsung mobile company, and this gadget is designed to use Samsung’s Artificial Intelligence camera software. Samsung Galaxy A9 also features AMOLED display having a resolution of 1080 x 222o pixels. This Smartphone has an octa-core processor powering it with 6GB/8GB RAM and even 128GB storage. It also has a design in a way that you can expand the memory storage using a microSD slot card up to 512GB. The battery for the Smartphone to use has a 3,800mAh battery. It is a Smartphone that runs Android 8.0 Oreo, weighing 183g and measures 162.5 x 77 x 7.8 mm. Sensors on Samsung Galaxy A9 gadget includes the RGB light sensor, proximity sensor, hall sensor, the geomagnetic sensor, gyro sensor, fingerprint sensor, and accelerometer. It is also supporting Samsung pay through NFC. This Samsung Galaxy A9 is expected to be in the market in November and retail for €599 I Europe and £549 when in the United Kingdom. Why does Samsung Galaxy A9 have 4 Cameras? This Smartphone has four rear camera sensors. The reason for developing this mobile gadget with four cameras is because the company has designed it for “Instagram generation”. In this improving technology generations, there is a need for good Instagram pictures, and you will need a camera that can capture descent and vivid images for uploading. It is the reason why Samsung has released a Smartphone to serve its purpose. Besides, the camera can take detailed and 3-D pictures through stereo photography process. Apart from images, the cameras can also capture explicit videos. Launching Samsung Galaxy A9 is the first evidence of mid-range mobile technology. According to Samsung Mobile Chief executive Officer DJ Koh, he has decided to change the strategy by differentiating points and bringing technology from the mid-end. The reason that is behind upgrade to new features is due to historical tend to debut the flagship gadgets and high-profit margins that can support Research and development costs for new technologies to develop. Currently, this market is slowing down because the updates are becoming incremental giving people few reasons to upgrade. For Samsung mobile, the slow down they face is due to the aggressive price of the handsets that are made in China and have been taking more market share. Some of the eye-catching features with new technologies like in-display fingerprint sensors are even appearing in mid-range gadgets which makes them attractive, and Samsung mobile is currently focusing on them.